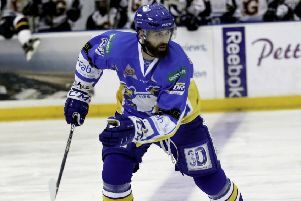 Defenceman Ian Young netted a double as Fife Flyers grabbed a superb 2-1 overtime win over Guildford Flames tonight. The sudden death win made the long journey home so much better after an exhausting trip south saw the team bus break down and the face off significantly delayed. Flyers put their travel troubles behind them to skate out the first period 0-0 – netminders Andy Iles and his Guildford counterpart, Chris Carrozzi shutting out the forwards. Flames got the go-ahead goal after 37 minutes play as Kruise Reddick turned the puck home. Fife were back on level terms inside three minutes of the third period as Young netted short-handed, and the blue liner wasted no time as three on three overtime got underway, finding the net within seconds to secure another huge road win for Fife. This was also their first win in three starts against an impressive Flames side which has made as superb start to its debut season back in the top flight, and it made amends for the loss to Dundee on Friday night. Flyers return to home ice on Boxing Day when they host struggling Edinburgh Capitals who were beaten 6-3 by Belfast Giants.